‘Tis the season for the cold and flu viruses to spread like wildfire. Colder, drier weather promotes the spread of viruses in addition to close proximity indoors. 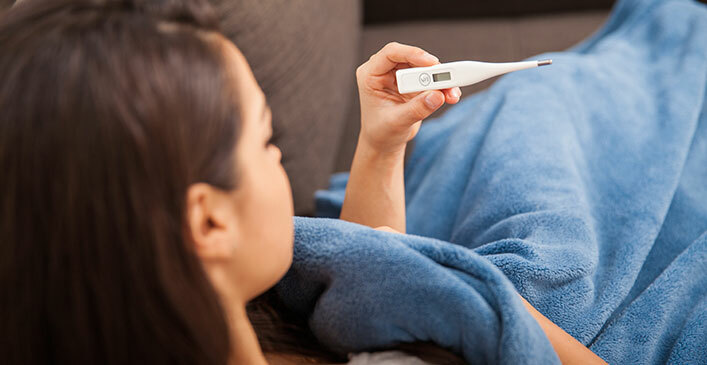 While no one wants to get sick, it is especially dreaded in the winter; here are a few easy ways to avoid coming down with a cold or the flu. According to the Centers for Disease Control and Prevention (CDC), the best way to avoid getting sick during cold and flu season is by getting vaccinated with a flu shot. The vaccine allows your body to build up resistance to the most common strains of flu. By putting a stop to the virus before it takes hold, you’ll have a better chance of fighting it off. Children, the elderly, and people with compromised immune systems should always get a flu shot to avoid serious illness or complications resulting from influenza. It’s also important to keep your distance from others who are sick to prevent the spread of disease. Any place where you are in close proximity to others, extra precautions should be taken. Wear a face mask when riding public transportation or if visiting family and friends in a hospital. Don’t share food or drinks with sick persons as the flu is highly contagious. Also avoid using towels or other hygiene items belonging to sick persons. Practicing good hygiene will also help prevent sickness from taking hold. Wash your hands after coming in contact with an infected person and before eating a meal. Avoid touching mucus membranes like your mouth, nose or eyes where germs can take hold easier. Thoroughly clean any surfaces that have come in contact with a sick person. Use an alcohol- or hydrogen peroxide-based cleaner like Lysol or Clorox. Products with bleach can also be used, but never mix cleaning products, especially with bleach. Doing so can cause extreme respiratory distress from inhalation. Aside from avoiding sick people, practicing good hygiene and sterilizing surfaces, maintaining your own health will help prevent the flu or a cold virus take hold. Keeping a regular sleep schedule will help your body stay rested and recharged every day. Adequate sleep is one of the best ways to fight off illness. Make sure to get seven to eight hours of sleep every night or whatever amount your body needs for prime functioning. Equally effective at strengthening the immune system and keeping infection away, 30 minutes of vigorous exercise or cardio will do the trick. A study published in the British Journal of Sports Medicine found that staying active can reduce the risk of getting a cold or the flu by 50 percent. Exercise can also help offset the effects of stress on the body, which can lower immunity unless regulated properly. Extra care should be taken after highly stressful life events such as a death in the family, divorce, marriage, having a child, or moving cross country. Eating well will also ensure cold or flu viruses won’t take hold. Three to four nutritious meals per day are necessary to get the proper daily intake of vitamins and minerals. That means eating lots of fruits and vegetables in addition to whole grains, lean protein, and a moderate amount of dairy, legumes, and healthy fats and oils. A multivitamin can be taken to supplement healthy foods so there is no vitamin deficiency. Extra vitamin C and D, as well as zinc, are very effective in cold prevention. Natural remedies and homeopathy have also become quite popular for home treatment and prevention of cold and flus. Echinacea, cat’s claw and astragalus are common herbs used to keep colds away and maintain a healthy immune system. Staying hydrated will also help keep bacteria and viruses from taking hold. Eight glasses of water a day is the recommended amount for adults or the equivalent of 2.3 to 2.7 liters. Children need about half to three quarters the amount as an adult. Keeping the mucus membranes moist during the winter will help keep colds away. Many viruses thrive in cold dry air, which already acts as an irritant to your nose, eyes and airways. Using a humidifier is a great way to combat dryness and prevent colds. There are different types of humidifiers — some that expel warm mist and some that expel cool mist. They can be built into your central air conditioning unit or there are smaller, portable units that can only be used within one room. Whichever you choose, be sure to clean them thoroughly after use to avoid mold growth and do not overuse. The best way to avoid the common cold or flu is to be mindful of your body. Get your flu shot as soon as it’s available and fortify your immune system with vitamins. Practice good hygiene, keep away from others who are sick, and eat, sleep and exercise well. Colder months can be unpleasant, so remember to take care of yourself first and you can make it through to spring illness-free.